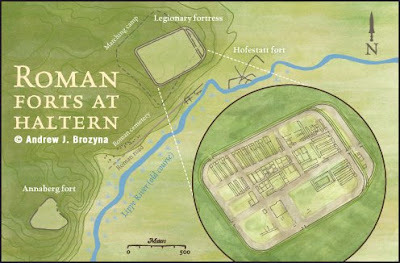 Page 24 of Ancient Warfare magazine's recent special issue on the Varian Disaster was meant to include my illustrated map. Unfortunately, a temporary sketch was accidentally printed in Duncan Campbell's "Secrets from the Soil" article. With the rush to get this issue out, I can understand how this rare error occurred. I would still like to share my work, so I have posted it here. What do you think? Duncan had the nice idea for the dagger compass. If you haven't seen this issue, I do recommend you pick up a copy! Nice map. I'll keep an eye out for this publication. Thanks! I think the magazine appears in some book stores in Europe, but in the US it is available by subscription only. A friend bought it for me for my birthday, very nice. Sorry to hear of the mix up, it's a good map. Thanks. I'm not bothered too much. Be sure to get the next regular issue of Ancient Warfare. I have 6 illustrations in that one! Now I know your name, I have seen loads of your illistrations in there, very good they are too. Thanks! That means alot coming from you, sir. I'm not as skilled with the realism, so I try to bring some graphic design style to my stuff: interesting fonts, composition, decorative flourishes, etc.